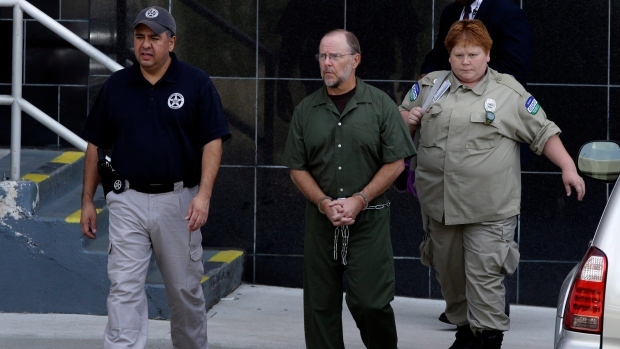 HOUSTON -- Former Enron Corp. CEO Jeffrey Skilling has been moved from a federal prison to a halfway house. The Houston Chronicle reports federal officials won't say where the halfway house is situated. According to the U.S. Bureau of Prisons website, Skilling is scheduled for release in February. The 64-year-old Skilling was initially sentenced in 2006 to 24 years in prison and fined US$45 million for multiple counts of securities fraud, conspiracy and other crimes. In 2013, the sentence was reduced to 14 years. Houston-based Enron collapsed into bankruptcy in 2001 after years of illicit business deals and accounting tricks that put more than 5,000 people out of work, eliminated over US$2 billion in employee pensions and rendered worthless US$60 billion in Enron stock.